Minnie came into Rescue on September 14, 2006, when she was only five months old. Born in a puppy mill, she had been sold at a Petland store in June and returned in September. The puppy was not walking properly and was having trouble breathing. The family’s veterinarian had suggested euthanizing her and the family wanted their money back. Petland sent the pup on to another local veterinary practice, where the staff fell in love with her. They called us. Minnie was, in fact, walking on her carpal joints. We took Minnie to VCA Aurora Animal Hospital, where she was examined by Dr. Steven Abel, a board-certified surgeon. He told us that her condition was most likely the result of her not having had a surface that provided good footing as she was growing. Being kept only in a wire cage, for example, may cause this disorder. Radiographs revealed no abnormalities. The condition sometimes resolves itself, and Dr. Abel suggested waiting. 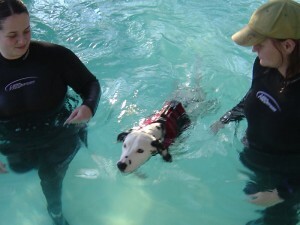 In order to provide gentle exercise for her joints, we took Minnie to Natural Healing Whole Dog Wellness for hydrotherapy several times each week throughout the month of October. Minnie loved everyone and enjoyed and looked forward to these sessions. In her foster home, she explored the yard with the other dogs and played with toys. Nevertheless, Minnie’s joints did not improve significantly. Her carpal joints often collapsed after only a few steps. In November, we returned to VCA and Dr. Abel placed casts on both her forelimbs. Even though the prognosis was guarded, we wanted to give Minnie every chance possible for a normal life. 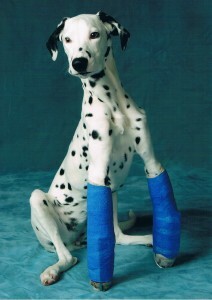 A real trooper, Minnie adjusted well to the casts, which she wore for a total of six weeks. 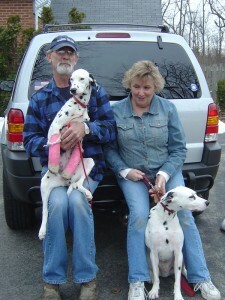 Before those six weeks were over, Minnie was adopted by our volunteers Joann and Ken Kempisty, and their Dalmatian, Sarge (adopted 2005). Minnie was a happy girl. She was cherished and cared for and had what every dog needs most: a family to love! 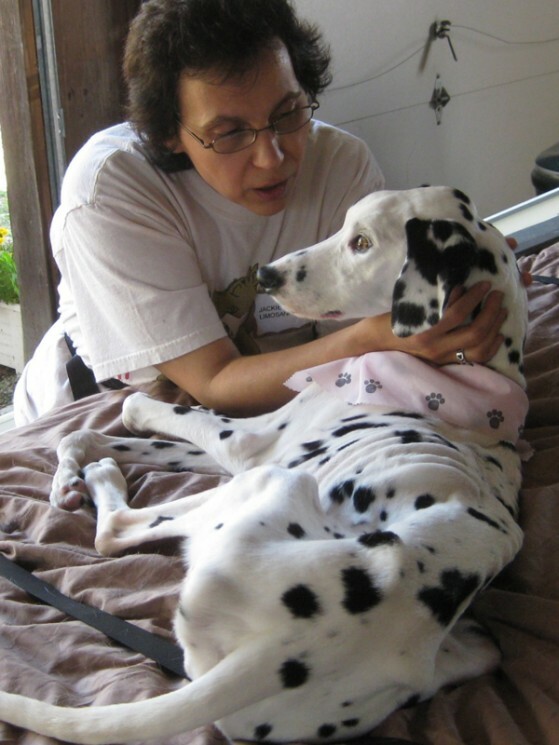 After the casts were removed, Minnie had physical therapy sessions with Patti Triola of Dogs in Motion and several sessions with a chiropractor. Unfortunately, no permanent change resulted. Minnie continued to walk on her carpal joints. Minnie learned to cope well with her disability. 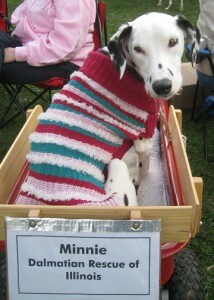 Minnie attends our annual Rescue Reunion every year and greets everyone with happy barks and lots of kisses. She’s a knockout in her classy sweaters! Everyone wants to know her story and how she is doing. Although she is in good health and has had excellent veterinary care, Minnie has had trouble maintaining weight over the years. She is a sweet and loving girl, and continues to enjoy life. I come here again and again to read about Minnie and watch her video. Each time I visit I cry. For sorrow, over the life that Minnie began with and for joy, over the people who took care of her. Please God, grant Minnie many many many years of love and happiness. God bless all who cared for this precious girl. Thank you, Cynthia. Minnie has an amazing spirit. I was so confident at the beginning that we could fix her problems. Everything we tried failed. But Minnie told us not to worry about it. Life is wonderful, no matter what. What an inspirational story. I just want to hug her… What a special girl! To everyone who has loved her, cared for her and given her her chance at life… Thank you. Bless her heart….I;m wondering if she could gain on a raw diet? She’s so little…love watching her come up the stairs such spirit. same emaciated body/ loss of muscle.. lots of pheripheral nerve damage as well. Did Dr. Abel ever consider surgery on the carpel’s? 1our neurologist has sent a video of Brighton to his chosen Orthopedic Surgical Vet to see if he would recommend having Brighton’s wrists fused. Dr. Abel did tell us that fusion was an option. We decided not to go that route. Try to imagine a dog walking without those carpal joints. Not pretty. Both the adopters and myself thought it would be potentially traumatic for Minnie and could make life even more difficult for her. And, of course, there would be no going back if it did not work. Minnie herself seemed happy and was adapting and that was what counted most. She is now eight years old and still doing well. thanks for the reply. in another similar case.. the dog DID get fusion and it only helped a little and not enough.. can’t find the link right now.